Are you a sock knitter dying to learn how to design your own knitted socks? 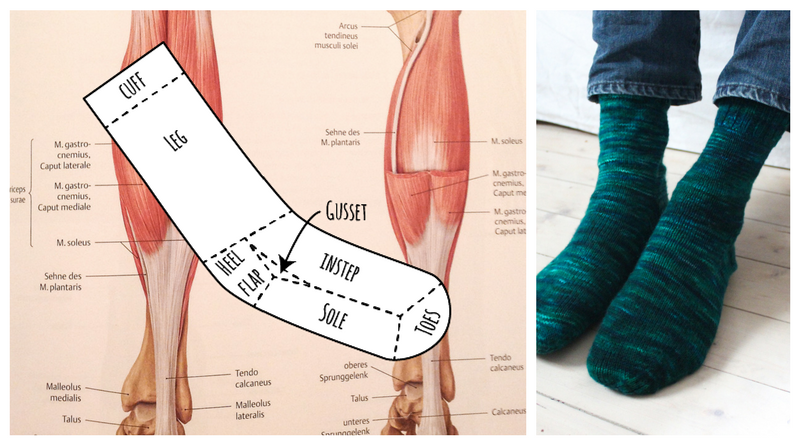 If your answer is “Yes!”, these sock design tutorials are the one-stop resource for you. Welcome to day #1 of Sock Knitting for Everybody! Today’s topic is an introduction to the anatomy of knitted socks. What are common techniques and elements in sock knitting? Socks keep our feet warm, make your most lovely pair of shoes look even better and are fun to knit, as they usually go faster than larger projects. Designing socks and stockings is not too complicated – at least if you know how to knit a pair of basic vanilla socks, but more on that later. The real challenge is to design socks which are not only pretty but wearable, too. And last but not least: they should fit your feet! So how to start? Let’s have a look on the basic elements of knitted socks. 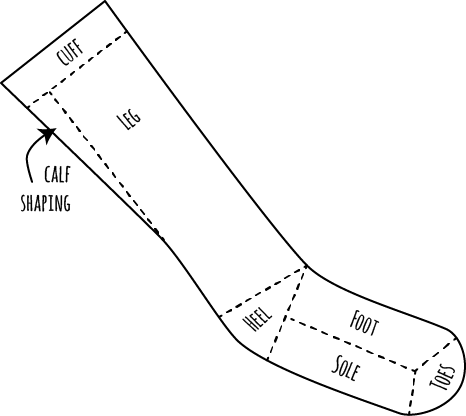 Common elements in knitted sock construction: this figure shows the elements of socks with heel flaps and no calf shaping. Cuffs are usually worked in stretchy (ribbing) patterns, some include lace edges and can be left out in case the leg pattern is stretchy by itself to prevent the socks from curling at their upper ends. The leg section might be skipped either (maybe you want to knit ankle socks?) and maybe includes calf shaping in case you’re working stockings. Heels are common element in socks and there are many different variants of ho to knit sock heels. But even heels are not mandatory: there are tube only socks for newborns, for example, or socks without heels on purpose (Yoga socks for instance). 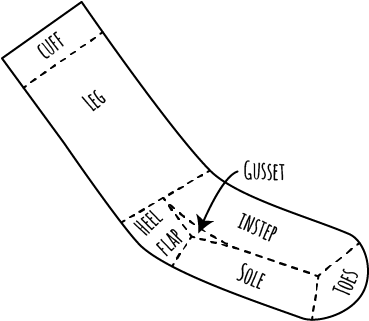 Common elements in knitted sock construction: this figure shows the elements of socks short row heels and calf shaping. Usually, socks include a foot section (okay, even here there might be some very special foot-less variants, but I cannot imagine such things are of good use – you?). Socks have toes in most cases and there’s almost as many toe variants as there are heel variants. Which way to work your socks seems to be kind of a religion: Some people love knitting toe-up and would never ever knit a top-down sock, some are the exact opposite. Others like both equally and switch as they like, depending on the pattern. In theory, no method is better than the other. When it comes to practice, make sure to match your sock elements and stitch patterns match your desired knitting direction – a toe-up flap heel has to be worked differently than a top-down one, for instance. Just to make it perfectly clear from the beginning: you don’t have to know how to knit short rows to be a sock knitter. Sock heel versions without one single short row do exist! So relax if you don’t want to bother with this technique, it’s okay. If you think this is a good opportunity to learn how to master short rows I advise you to read my Complete Guide to Knitting Short Rows and get some practice! Are You a Sock Knitter? Are you a sock knitter who wants to design his or her own socks, finally? Did you ever attempt to design your own pair of socks? I’m curious to hear your story – please leave a comment below!